If you are new to aromatherapy, you may not have known a carrot seed essential oil existed. For more seasoned aromatherapist, I bet carrot seed essential oil is a staple in your repertory of aromatherapy ingredients. Although this is typically not a common oil among aromatherapy lovers, it is a very powerful and necessary oil. It is however, a popular choice with those who practice aromatherapy in a more professional setting, especially with skin and body care, mind-body restoration and maternal nurturing. When you are becoming familiar with an essential oil and building your relationship with what it can do, you want to evaluate the whole plant in addition to the scent. I usually start by smelling the oil first, connecting with the scent qualities, feeling where it connects in me (the stomach, throat, chest, etc.) and being mindful of the thoughts, visions, ideas and memories that are brought into my awareness. This will give you insight to what it can help get balanced or maintain what is already in balance. Carrot seed oil has a distinct scent offering woody, earthy notes with hints of sweet and fresh undertones. This umbelliferae family member oil is steam distilled from the seeds. The plant itself has a tough taproots with stalks that grow above the ground, reaching upwards of three feet tall. When we assess and apply the plant signature philosophy, we are looking at the characteristics of the carrot plant as a whole. We see that the taproots are tough. In translation, or scenterpretation™, we can tell that this oil, via inhalation or topical application, can reinforce someone’s tough roots, or to enhance someone’s roots who may be weak and sluggish. It provides a sense of grounding, driving your roots deep into the earth to help you sustain life’s daily challenges. You would apply this theory for physical, mental, emotional and energetic situations. As you can already see, it has a reputation of being trophorestorative, restoration of vital functions. The stems and leaves of the carrot plant, Daucus carota, are covered with coarse hairs and it does not produce those beautiful clusters of tiny white flowers until its second year, before it dies. The scenterpretation™ you can take from the coarse hairs, and a delay in sprouting its fruit (or flowers) are significant of the theme of protection. Those who do not trust easily, and only give trust once a relationship has been cultivated for a while (maybe two years), carrot can help them connect with their our issues surrounding trust, as well as be more mindful of the protective barriers they build. Carrot seed has some incredible benefits for not only physical skin issues, but also to enhance our mind and nourish our emotions. It has an affinity for maternal nurturing, helping you feel not alone and abandoned. Through inhalation, it can assist in clearing psychic and cognitive blockages, bringing a greater mental clarity by calming down mental chatter. And inspiring courage by reducing nervousness. 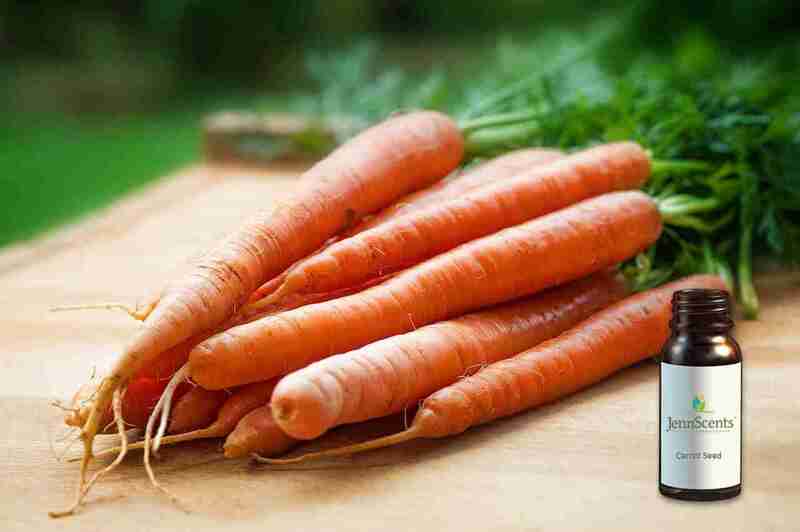 Physically, carrot seed oil is a star when it comes to skin restoration. It helps with skin irritations, rashes, blemishes, age spots, discolorations, pigmentations and strengthens skin elasticity. I share one of my favorite skin repair recipes below. It’s properties include being antibacterial, antiviral, anti-inflammatory, cicatrisant, galactagogue, hepatic and vulnerary. My Favorite Recipes Using Carrot Seed Essential Oil – Skin Restoring Salve, 2oz. Warm up shea butter slightly until it becomes very soft. This will make it easier to mix and stir. Then add in the carrier oils and mix gently (so the carrier oils do not splash out) until completely blended. Next, add in the essential oils and mix again until completely blended. Cap, label and store in a cool, dark place to preserve the potency and integrity of the repair salve. Happy blending! If you want high-quality skin care products, that is already made up for you, check out our products from our botanical skin care line. Formulated with the top, result-driven botanical ingredients for physical support as well as mental and emotional nourishment such as our Sunburn Soother, JennScents Face Oil, Hyperpigmentation Serum and Face Renewal Moisturizer.